£1. That's how much this dress cost. £1 in H&M's sale. Madness huh! We picked up a huge bunch of bargains last weekend so I will be filming a haul video very shortly. I love the shape, fit and length of the dress and the colours of the stripes. Basically everything about it. If I could magic it into my size I would be very happy! I was also delighted to find this plain Mustard coloured cardi for Little I and think it goes quite nicely with the contrast of the stripes. 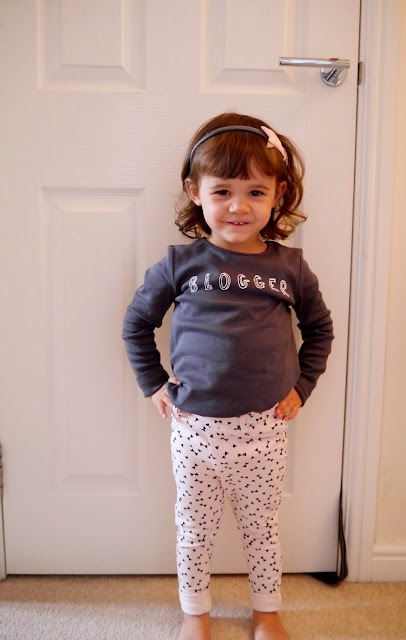 Well it had to be this little cutie in her Next 'Blogger tee'! I've also bought this for Little I and am excited for her to wear it. 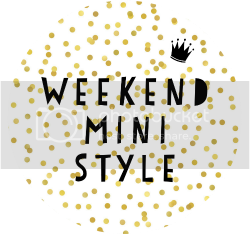 Kerry from All About A Mini Norris has teamed Eva's tee with the cutest H&M bottoms. How fab does she look? Gorgeous dress - she is always such a stylish little lady :) I love that t shirt as well, ha ha, a bit of a meta shirt for bloggers if there ever was one :D I think I might need to try to find that or then the blogger shirt :) thanks for hosting! Oh my God, I actually have that dress! It's from H&M too ... Go hunt it out, it's definitely an adult one! I was thinking you must be having completely different weather to us, then saw the second outfit - what's up with the rain?! I have read your post that is full of information thankyou for sharing your ideas with us.